Pine wilt causes rapid wilting and dying of pine trees, particularly Scots (Scotch) pines. Pine wilt is particularly common in scotch pines but is capable of infecting other non-native pines as well. Symptoms of the disease include wilting, browning needles and eventually tree death. The pine wood nematode is spread by pine sawyer beetles, which bore under the trees bark. Nematodes and their eggs that have attached to the beetles are then transported to other trees that the beetles colonize. Keeping other trees stress free and avoiding wounding can help to reduce this spread, as the beetles are attracted to such trees. 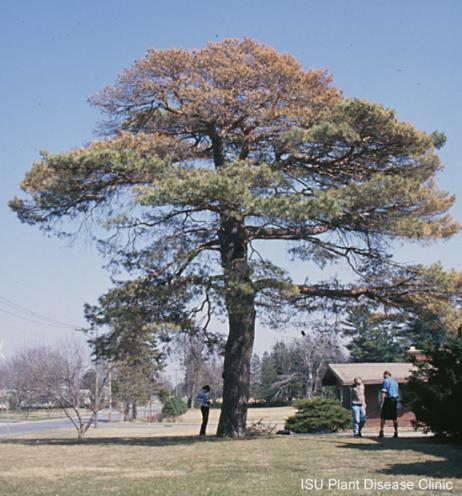 Inspecting your other nearby pines is critical to controlling this disease. Dead and dying trees can be sources of bark beetles. Removal and destruction of these trees is the only effective line of defense in controlling pine wilt. The optimal time to remove such trees is during the winter months when the beetle is inactive. Infected trees should then be promptly burned, chipped or buried to reduce the risk of bark beetles spreading to healthy trees. Pine wilt causes rapid wilting and dying of pine trees, particularly Scots (Scotch) pines. See this link for more information about pine wilt. This fall some of the needles on my white pines have turned yellow and begun dropping to the ground. Is this a problem?